In response to industry demands for small versatile cooling units, Kooltronic now offers the new Advantage Series Filter Fans. Unique to the series is a clean, linear design, characterized by its extremely flat profile, which keeps the unit from protruding from the cabinet wall. 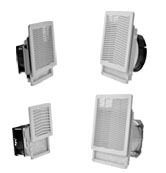 Fast Mounting: With elastic hooks and an integrated seal, the Advantage Series Filter Fans can be mounted easily into the opening provided on the panel. There is no need for extra screws or preparation. Wide Range of Mounting Dimensions: The precise planning of the elastic hooks and gaskets allow the fans to be mounted in openings with a tolerance range of 0.059 inches [1.5mm] and a plate thickness of between 0.039 inches [1.0mm] and 0.098 inches [2.5mm] (see individual units).